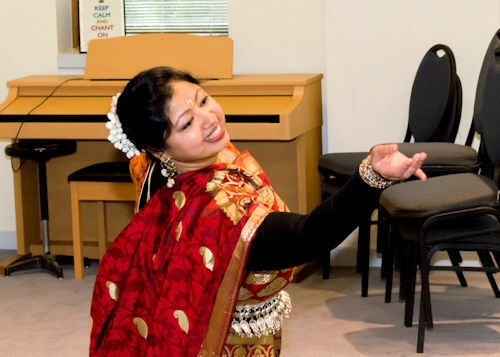 Dancer at the SGI Canada Day General Meeting in Calgary. On September 30, SGI Canada practitioners celebrated the 25th anniversary of SGI President Daisaku Ikeda's visit to Montreal and Vancouver in 1993. From British Columbia to Nova Scotia the celebrations saw an unprecedented effort and resulting attendance. Through much chanting and connecting with friends and family though the weeks and months prior to the meetings, each venue soared with a vow to bring true happiness to all members of society. 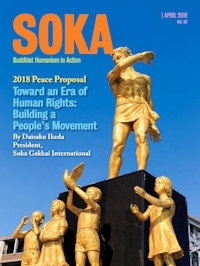 In his message to Canada, President Ikeda said that kosen-rufu is an unprecedented, large-scale undertaking to build peace and achieve happiness for all humanity. He also added that the reason SGI has been able to grow and advance into 192 countries worldwide is due to the harmonious community of practitioners advancing, united in purpose and based on faith that is directed toward realizing the shared objective of kosen-rufu. He explained further that the objective of kosen-rufu is to enable each person to shine to their fullest, giving full play to each person’s unique mission, personality, talent, and set of circumstances. 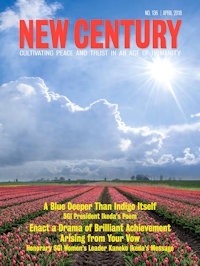 The meetings consisted of sharing personal experiences displaying the benefits of the Buddhist practice, an introduction of the practice for new comers, videos of the national SGI Canada leaders determinations, a video of President Ikeda's visit in 1993 and cultural presentations by SGI Canada youth. The highlight of each meeting was the number of people who decided to officially join SGI Canada. Their testimonials of starting this practice of chanting Nam-myoho-renge-kyo and the improvements to their health and happiness were encouraging to all. The feeling at the end of the meetings was joyful and full of pride that we had accomplished something never before seen in Canada and that with united determination SGI Canada will soon achieve a membership of 10,000.